Although the Islamic tradition requires that a body be buried within a day of death, Israeli authorities held Sharif’s body for over two months, thus preventing the funeral and denying the religious rite. The extrajudicial assassination of Sharif, who was killed with two shots to the head while lying wounded on the street, sparked international outcry when a video was released of his murder. The soldier who killed Sharif, Elor Azaria, faced charges of ‘manslaughter’ but not murder. His trial began on May 10th. He was released from prison in order to celebrate the Jewish holiday of Pesach, a decision that was criticized by Palestinian and international observers. At the funeral of Sharif on Saturday, his father criticized the trial as an attempt by Israeli authorities to “mislead international public opinion”, since so many soldiers kill Palestinians with complete impunity. On Saturday, the Palestinian security forces in Hebron moved the body of Abdul-Fattah Sharif from the al-Ahli hospital to an ambulance, where family members gathered to give the young man their final goodbyes. 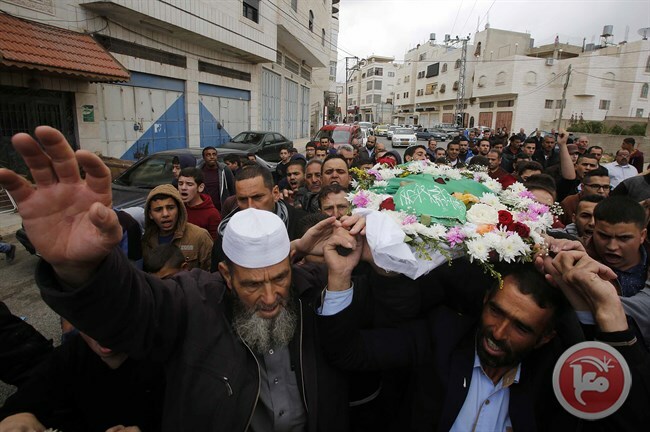 Mourners carried his body to the Martyrs Cemetery in Wadi al-Hariyya, in central Hebron. During the funeral march, the participants chanted for an end to the Israeli occupation and to the ongoing expansion of illegal Israeli settlements on Palestinian land in the Hebron area. During the funeral itself, family members and community leaders made speeches, including a eulogy by Sharif’s father in which he thanked God for bringing the body of his son back, and criticized the Israeli authorities for trying to stop the family from holding a funeral. The family had been promised the return of Sharif’s body this week, but were concerned when the Israeli Minister of Public Security, Gilad Erdan, announced Tuesday that the Israeli authorities would cease returning bodies of slain Palestinians back to their families, because he had seen video footage of crowds of mourners saying ‘God is Great’ at the funerals of other slain Palestinians. 21-year old Abdul-Fattah Sharif was killed on March 23rd, along with his friend Ramzi Aziz Qasrawi, 21. The two were killed after allegedly lightly wounding an Israeli soldier with a knife. Sharif was executed by a shot to the head while lying wounded on the ground. The video of the incident shows Israeli soldiers and paramilitary settlers milling around while two Palestinians are lying on the ground, one wounded and the other already killed. As an ambulance carts away the Israeli soldier who was mildly wounded by a small knife wound, one of the soldiers lifts his gun and shoots the prone, wounded Palestinian in the head, killing him. Although the soldier who fired the fatal shot was charged, no other Israeli soldiers or officers faced charges – despite evidence that the order to kill Sharif was given from higher up the chain of command.